Access Cover Original Roll Up Velcro - Complete Vehicle, Inc. These Access soft tonneau covers are built with durable, reliable, and stylish components to give you an excellent finished product. They feature an exclusive slant back design for optimum airflow over the rear of the covers. The Access soft tonneau covers feature Autolatch, a patented system that automatically locks when closing the tonneau covers. The slide lock mechanism works in conjunction with a locked tailgate for maximum security. Their superior Velcro® hook and loop system provides continuous high sealing strength throughout the full length of the truck box. The Access soft tonneau covers use special Tight Bite clamps, manufactured from aircraft-grade aluminum, to secure the bed rails and maintain a superior grip. Also included is their patented XT-Dial tension control system, the easiest and most effective control system available. Finally, they form a tight barrier with the front element seal, which provides double protection with the integrated fabric flap. 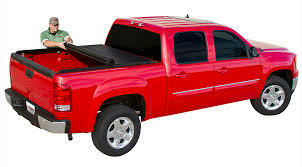 Reduce aerodynamic drag, streamline your truck, and increase gas mileage with one of these Access soft tonneau covers.